Pick your robot, pick your pilot, pick your weapons, and pick your victim in GKR: Heavy Hitters! This fast-paced strategy arena game lets you put the pedal to the metal—and the metal to the face of more metal—with a beat ’em up, shoot ’em up gameplay. 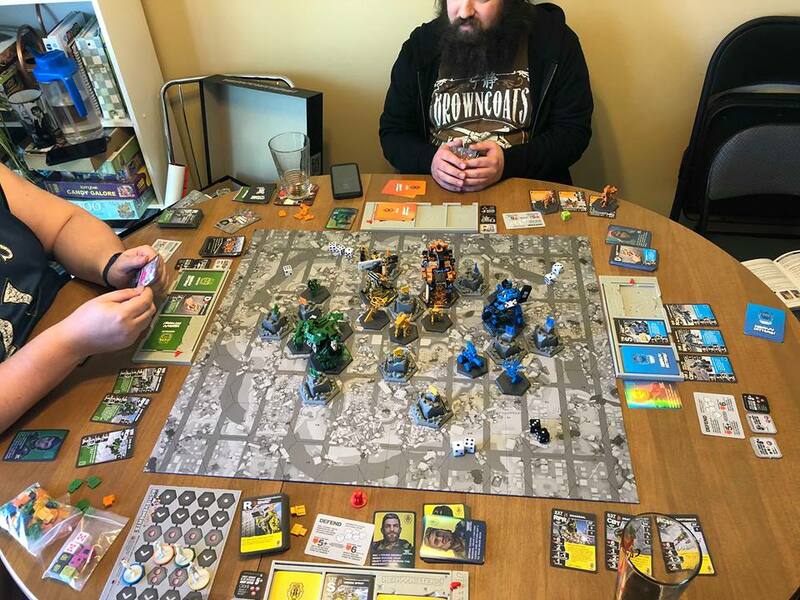 Fans of Pacific Rim will especially find fun in GKR, since it isn’t every board game that lets you pilot your own Giant Killer Robot! In the setting of the game, televised giant robot arenas have become a worldwide sport. With any megasport, there are sponsors, and there is the strategic destruction of your enemies. At the start of the game, the players each pick one of four color-coordinated robots, each with their own unique weaponry decks. From the decks, players choose the default cards, like shields from certain types of attacks, or orbital strikes and such. To make their combat more unique, players also choose from a few primary and secondary weapons, which are the bread and butter of combat. Finally, to aid your sponsored beatdown, you also have three smaller robots at your disposal, acting as a repair bot, a scout, and an artillery unit, and you choose from a deck of pilots who also each offer a unique ability to the mix as well. Left to right: the Yellow Jacket, the Green Meanie, You’re My Boy, Blue!, and Agent Orange. There are several ways to win this game, all falling into the flavor of the sport. The default method of victory is once the first GKR dies, whoever has the most health wins. The game also suggests a variant to this: last robot standing; which I think is more true to the spirit of the game. The other method to win involves the landscape of the game. On the map, there are several buildings across the board, which offer potential advantages—such as cover from enemy fire. You can “tag” a building, marking the tower with your sponsor’s logo, and by doing so you gain a random card offering you more options in the game, like hacking your opponent’s robot and limiting their actions for a turn. All of these hacks come from other sponsors, of course. Once the fourth tag has been placed on a building, it collapses, and the robot who collapses four towers wins the game as well! This method is rather difficult, in my own opinion, because if you even make it to three towers, you become a huge target of the other players. Overall view of a GKR game in play. Run, shoot, tag, and kill are the spirit of this game, and I love it. GKR really hits it out of the park on nearly all fronts. The quality of the robots is exceptional: not only is each one entirely unique from everything else, but the details on them are also invigorating. Other games can provide unpainted gray blobs for figures, leaving you to either cope with it, try to paint it on your own, or pay someone else to. The combat system is also great. The first player of each round constantly rotates in a performance-based manner, making the game harder to predict and ensuring the order of action stays fresh. The cards used for combat add many layers to thinking of a strategy; some can only be used once, while other can only be used at a restricted range from your target. This isn’t a game in which you place yourself in the line of sight and just dump your attacks on someone. Each robot has 5 energy to use for actions each turn, and although they can go to −5 in actions, it will cost them health for each point they go into the red, so you need to ensure the cost of your actions is worth it. Most of all, I love the spirit of this game. It is practically contagious in the players. I quickly found that we were proudly representing our company sponsors and delightfully accosting our opponents. We looked for weaknesses in someone’s defense and ruthlessly went after the openings. Once there was blood in the water, the assault couldn’t be stopped. GKR: Heavy Hitters is for one to four players and can take between one and two hours of playtime. The game recommends ages 12 and up, which I can agree with—little pilots might not be able to run all the controls of the robot, ya know? If you are looking for a tight, fast, and action-packed game, look no further. GKR is an excellent addition to your shelfie and can easily hold its replay value for years after purchasing.